Chandigarh: A Chandigarh court has reportedly sentenced hindutva activists Nishan Sharma, Ramesh Datt Sharma and three other convicts to undergo imprisonment for three years for attempting to attack Sikh political prisoner Bhai Jagtar Singh Hawara. As per media reports the sentence was announced today. Nishant Sharma, along with his accomplices had attempted to attack Bhai Jagtar Singh Hawara during a court appearance in Chandigarh. Interesting, Bhai Jagtar Singh Hawara was quick to notice Nishant Sharma’s activity and slapped him so hard when he came close to him. 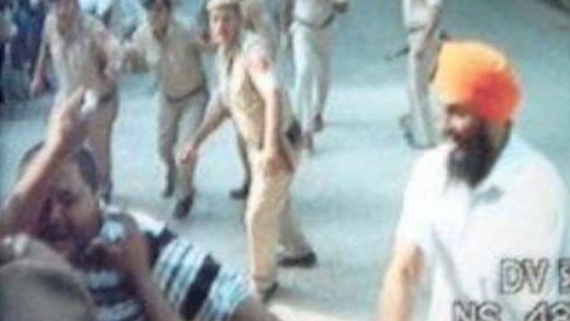 Notably, Bhai Jagtar Singh Hawara was in tied with chains at that time and he was in custody of police force. This incident that taken place on 11 September, 2018.